Co-chair, Taylor Swift, channeled Blade Runner for the ‘Manus X Machina’ themed gala. The theme for this year’s Met Gala was “Manus X Machina: Fashion in the Age of Technology” and celebrated the coinciding exhibit which highlights technology’s effect on the world of style. On the red carpet the theme inspired fashion’s elite to wear garments that featured metallic details, latex, and a ton of silver. Chaired by Anna Wintour, Idris Elba, and Taylor Swift (who could have passed for a Replicant à la Blade Runner) the event attracted A-listers from across the celebrity spectrum. This year that included a full roster of social media stars and young supermodels, including Kendall and Kylie Jenner, Imaan Hammam, Jourdan Dunn, and Gigi and Bella Hadid. The Hadid sisters both accessorized their looks with male musicians- Giga attended the fete with Zayn Malik in tow while Bella came with boyfriend, The Weeknd who was introduced by Elba as “Abel with the good hair” before taking the stage to sing hits such as “In The Night”and “Can’t Feel My Face.” The performer was joined by rapper Nas to perform 2015 track, “Tell Your Friends.” Other leading ladies who attended with significant others included Nicole Kidman, with hubby Keith Urban; and Kim Kardashian-West and Kanye, who were crowned best dressed couple of the night, an honor that made Mr. West so proud that he immediately took to Twitter to give a shout-out to the Gala. One power couple that was noticeably missing from the event were Beyoncé and Jay-Z. Although Queen Bey made her presence known in a beaded Givenchy latex gown, Mr. Carter was no where to be found, adding fuel to the fire of rumors ignited in Lemonade and making everyone remember the 2014 Met Gala “elevator incident.” Another famous absentee was Rihanna. Her Guo Pei dress was the talk of the night at last year’s ball but this year she missed the party to perform in California. However, there was still a noteworthy pop-star presence at the gala. Madonna and Lady Gaga both showed up to exhibit their signature wild card style. See below for The Untitled Magazine’s picks for the best looks of the night. Brie Larson in Proenza Schouler, Lauren Santo Domingo in Giambattista Haute Couture, Taylor Swift in Louis Vuitton, and Kendall Jenner in Atelier Versace. Silver and side cut-outs were major trends of the night. Kylie Jenner in Balmain, Poppy Delevigne in Marchesa, Julie Macklowe in Phillip Plein, and Ciara in H&M. These theme queens best represented “Manus X Machina” by channeling ravishing robots in the vein of 1920’s art deco/sci-fi film, Metropolis. 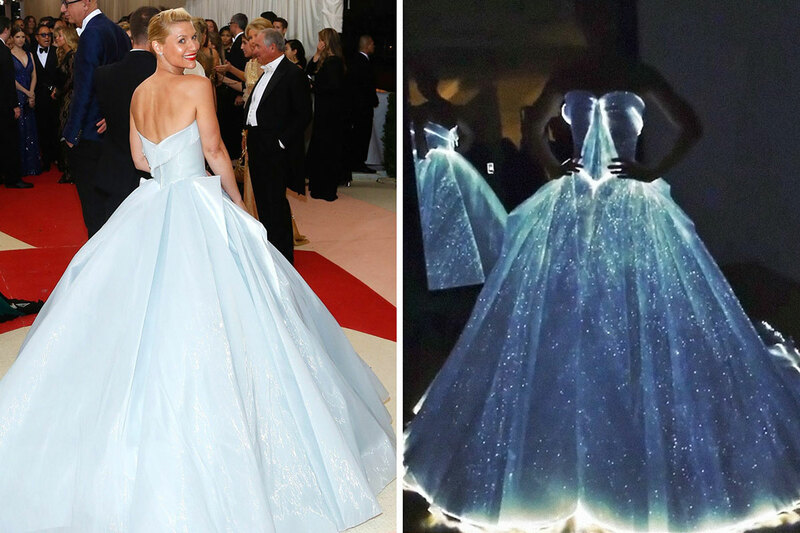 Claire Danes was a techie princess in a Zac Posen dress that lit up up with the help of LED lights. The Weeknd in Givenchy, Bella Hadid in Givenchy Haute Couture, Kim Kardashian West in Balmain, Kanye West in Fear of God, Keith Urban & Nicole Kidman in Alexander McQueen, Gigi Hadid in Tommy Hilfiger, and Zayn Malik in Versace. Couples ruled the red carpet. Zayn Malik and Kanye West may have even out-accessorized their better halves. Malik rocked a robotic arm while West sported blue contact lenses. Bee Shaffer in Alexander McQueen, Beyonce in Givenchy Haute Couture, Blake Lively in Burberry, and Zoey Deutch in Dolce & Gabbana. Although flowers don’t exactly scream “technology,” it wouldn’t be a spring event without a few fabulous florals. FKA Twigs in Atelier Versace, Rachel McAdams in Valentino Haute Couture, Sienna Miller in Gucci, and Zendaya in Michael Kors. These stars opted for the other metallic, giving the red carpet a Midas touch. Madonna in Givenchy Haute Couture and Lady Gaga in Atelier Versace. Unsurprisingly, Madonna and Lady Gaga were the fashion rebels of the gala and had their own signature takes on the theme.